It's not exactly the most surprising news of the year, but the HTC One Max has been officially unveiled - giant screen and all. The numerous rumours, leaks and speculation over the past months seem to have been pretty much on money, with the headlining feature of the One Max being its 5.9-inch, full HD display. Other goodies include Qualcomm's Snapdragon 600 processor (which is a slight disappointment as we were hoping for the newer 800 model), a 1.7GHz quad-core chip backed up 2GB of RAM and the choice of 16GB or 32GB of internal storage. There's good news for expandable storage fans too, as unlike the HTC One, the rear of the One Max can be removed providing access to a microSD slot. Rather interestingly the HTC One Max is the second smartphone this year, after the iPhone 5S, to sport a fingerprint scanner - although it's placed on the rear of the device instead of the front. We're not sure how easy that's going to make usage. Other features included the same Ultrapixel rear camera as found on the One, 2.1MP front facing camera, NFC, 4G and a 3300mAh non-removable battery. It comes running Android 4.3 and HTC's new Sense 5.5 overlay, while the full metal chassis measures a palm stretching 164.5 x 82.5 x 10.29mm and weights a hefty 217g. 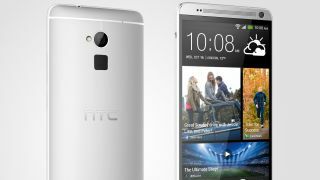 In terms of a HTC One Max release date the handset will be available globally between the middle and end of October - although exact dates for regions are yet to be confirmed. There's currently no word on a One Max price, but considering its specifications you can be sure it's going to be at the top end of the scale.